← Spirit-filled Orthodox Jews? Paradigm-shifting. Wall Written has corrected MY oversight and the missing yod has been found…. 😉 Updated pics below and on their website. Available in various sizes and 0ver 45 colors!! I am quite excited!! I was going to wait to share this cool information, but the cat is out of the bag! We have recently repainted our living room and I wanted a border high on the wall. After playing with some ideas I came to the conclusion that it would be really cool if I could have several verses in the original Hebrew script…. But, the cost! Well, the idea is still in development as it has continued through some additional twists, but the first part is finished as a wall vinyl… and, you too can have one at a most reasonable price, in the color and size of your choice! First, look at this shot of how the Shema will look. It even has the enlarged ayin and dalet. It started with me reaching out to WallWritten.com and asking if they could do Hebrew Script. Melissa replied that if I could send the text, she would work with it and see if her software could pull it off. Well, I cut and pasted the Leningrad Codex text for the Shema from Blue Letter Bible and she created the below pictured text minus the enlarged letters. I explained the importance of this detail and she redrew the image and scaled it to the size I wanted. Well, I was not planning to make an announcement about this, except she followed my suggestion and put it up on the Wall Written website. Mine hasn’t even shown up in the mail yet…. So, I’ll have to update with pictures later. The website has a neat tool where you can select your wall color, then select the text color to give you a great idea how the finished piece will look. For me, the Shema will go high on the wall we turn toward when facing Jerusalem. After we agreed on the final piece and I placed the order, I had another cool idea that is in the works… As soon as I get it, I will take pics and post them up, because I am quite excited about this little piece for my office wall. Here is the link to go order yourself one! Please pass this info along for others to benefit from this super reminder/conversation starter to have on their home or office wall. 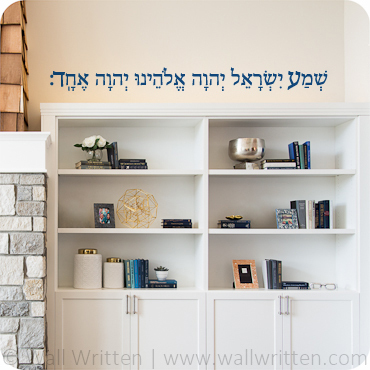 This entry was posted in A Thought... and tagged decor, Deuteronomy 6:4, Hear O Israel, jots and tittles, shema, wall vinyl. Bookmark the permalink. Yes!!! An you have helped her out much too I’m sure. Thanks again. That was a cool idea! Thank you for sharing. I want to do this myself on one of my walls, but after I live in an apartment where I may not paint anything on the walls I will fabricate a banderole with the shma and tape it on once it is done. Looking forward to see yours when it is sitting on your wall. I have done on curtain 2 banner before which are now decorating my walls in the living room, the .Yerushalayim emblem and Menorah_Israel emblem. I do think these vinyls are easily removable. Other verses I am working with include Psalm 137:5-6, Psalm 133 and others… I want to ‘wrap’ the room eventually with Hebrew Scripture as a border. But, the other item she is working on for me is even more exciting…. Can’t wait to post pics of it! I dont know where my comment is. Please make sure that you Write Yisrael with yud!! YUD is missing. Someone caught that on Facebook. I’ll check the proof and advise them of the glitch. Easy fix. Thank you for the sharp eye! Fabulous!!! Many of the folks here have the Commandments written around their door frames – this idea would work well for that, too. Way to go, Pete! Thanks!! I think it’s cool, too. 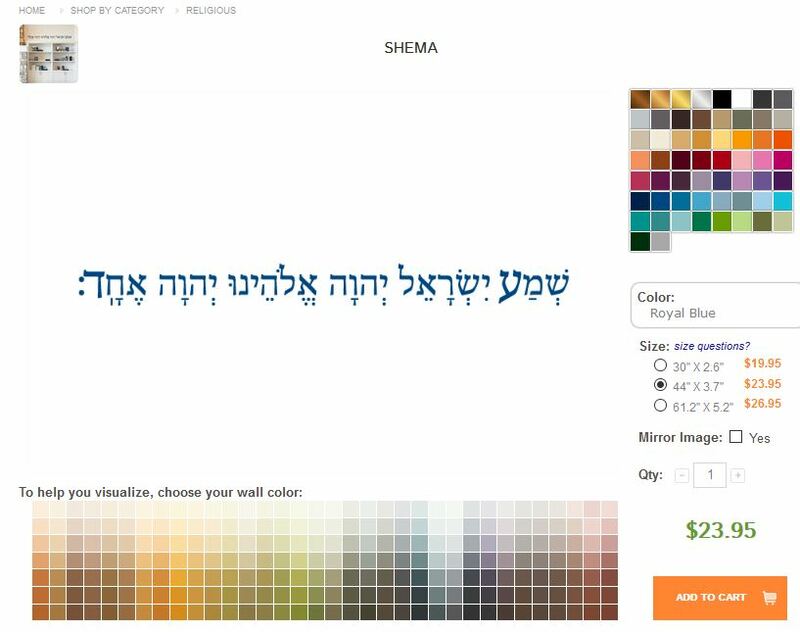 Stef also does home decor in Hebrew also and is working on a website for it for sale. Cool. After she’s up and running, let me know.